The purpose of the Initiative is to foster sustainable blue growth and jobs, improve safety and security and preserve ecosystems and biodiversity in the western Mediterranean region. This will be achieved through coordination and cooperation among the relevant countries on three main goals and a few priority areas of action. While geographically speaking the Initiative focuses mainly on the seas and coasts surrounding Algeria, France, Italy, Libya, Malta, Mauritania, Morocco, Portugal, Spain and Tunisia, it also addresses the marine and coastal areas as interconnected systems. The scope of the actions may therefore vary depending on specific needs, and the Framework for Action remains open to other partners in the Mediterranean region. How Mediterranean coastal regions can cooperate to ensure a common and shared support to the implementation of the Blue Economy, IMP, including MSP? What type of governance framework can support such cooperation? What are the main actions that can be implemented at the Western Mediterranean basin level to ensure a coherent implementation of IMP and MSP? How can the sub-national government levels be better involved in the implementation of IMP, including MSP? The maritime economy of the western Mediterranean region has huge potential for development in all related sectors. The region has 200 ports and terminals and nearly 40% of all goods (by value) pass through the Mediterranean. The western Mediterranean region attracts the largest number of tourists in the Mediterranean basin, in part because of its art and cultural wealth. It is a biodiversity hotspot, with 481 marine protected areas, including Natura 2000 sites. The region is a rich fishing ground, accounting for over 30% of the total value of landings at first sale in the Mediterranean and providing more than 36 000 direct jobs on fishing vessels. Despite these major assets, the region faces a number of challenges which add to its general geopolitical instability: a prolonged economic and financial crisis with high youth unemployment in several countries, growing coastal urbanisation, the overexploitation of fish stocks, marine pollution and last but not least the refugee crisis. Climate change greatly affects the region, and the rise in sea level is a major threat to coastal ecosystems and economies. Other factors such as population growth and ageing, migration and deepening globalisation will also magnify these pressures. • preserve ecosystems and biodiversity in the western Mediterranean. 3. Better governance of the sea. Actions will seek to improve the management of maritime, marine and coastal areas by local actors and ensure an appropriate and coordinated implementation of the EU Maritime Spatial Planning (MSP) Directive and the Protocol on Integrated Coastal Zone Management (ICZM) of the Barcelona Convention for addressing the cumulated impact of economic activities at sea and on the coasts based on ecosystem approach. They will also aim to improve our knowledge of land-sea interactions and develop eco-friendly engineering solutions for the good environmental status of seas and coasts. Another key area of work will concern the tools to select appropriate sites for offshore installations and to fulfil the energy and environmental requirements of the region. 1. Tailoring responses to challenges and tackling geographic or thematic asymmetries, for example by focusing on cross-border threats in order to reduce risks and mitigating their consequences; benchmarking for decision-making. 2. Bundling interventions and promoting horizontal coordination and enforcement. Examples include obtaining economies of scale, using resources more efficiently, providing citizens with better services and implementing international agreements and commitments. 3. Promoting the awareness, alignment and vertical coordination of existing strategic initiatives and/or actions among stakeholders at local, regional or national level, for example by aligning policy frameworks where appropriate and desirable, networking and promoting best practice, and disseminating results. Political coordination will be provided through the existing mechanisms and processes of the Union for the Mediterranean, including senior officers’ and ministerial meetings. Operational coordination will be ensured through a WestMED Task Force linked to the Union for the Mediterranean Working Group on the Blue Economy and will include national focal points from the relevant ministries, the European Commission and the Union for the Mediterranean Secretariat. - Priorities: the main areas where the Initiative can create added value, either by tackling a challenge or by seizing an opportunity. For each priority, the Framework for Action presents tables with possible actions. - Actions: interventions and projects (such as new approaches, closer coordination in policy making, investments, training or networking initiatives, policy reviews) that countries and stakeholders carry out to address the different priorities of the Initiative. All interventions should not preclude existing EU competences and legislation. -Funding sources are also indicatively proposed. They are subject and without prejudice to the assessment of the evaluation procedures and criteria for the concerned funds, programmes and projects. - Targets: result indicators are proposed and as far as possible quantified for each goal. Baselines and timeframes have been determined or estimated for most targets. - Union priorities: Description on how the actions identified will help implementing the European Union’s priorities ‘Jobs, growth and investment’, ‘Energy Union and climate change’, ‘Migration’ and ‘A stronger global actor’. - Background projects: examples drawn from reports and from stakeholder inputs to stimulate further initiatives and to illustrate what is needed. 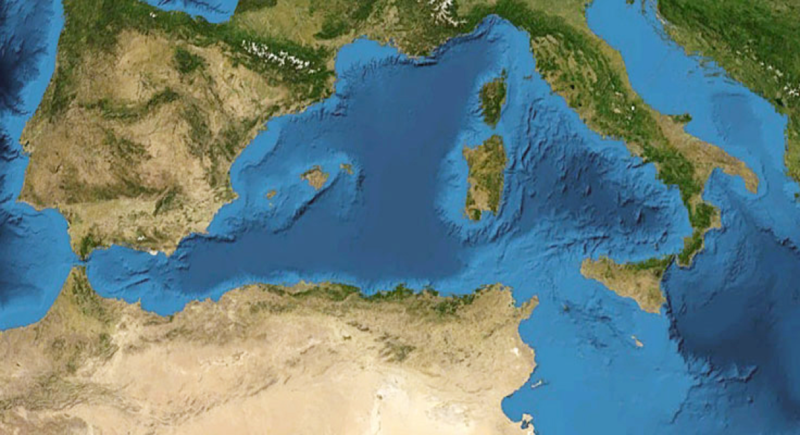 Although the Initiative focuses on the western Mediterranean region and the 10 countries mentioned above, its scope of action — and potential benefits — could easily extend beyond this sub-basin. Therefore, depending on the needs to be addressed, actions may involve partners in the central Mediterranean and north-east Atlantic and will remain open to other partners. Given that it concerns both EU and partner countries, it will have to be politically endorsed first in the EU and then in the Union for the Mediterranean, bringing together all the 10 countries concerned.